The best available science shows that to recover the orcas we must both increase the amount of salmon, and decrease the amount of noise. The sight of a grieving orca carrying her deceased calf has brought worldwide attention to the plight of our endangered southern resident killer whales. Restoring salmon alone is not enough to save these beloved and iconic pods. Three issues have brought J, K and L pods to the edge of extinction: lack of salmon, toxin accumulations, and vessel noise and disturbance. These work together like a three-legged stool, each impacting the other. Toxins like PCBs are stored in the orcas’ blubber and mother’s milk. When whales are stressed or hungry, the toxins may be released into their bloodstream, making them more susceptible to disease. Boat noise makes it harder for the orcas to hunt, which makes them stressed and hungry — and so it goes. Orcas are acoustic animals. They rely on sound to find and catch their prey, and to communicate with each other. A recent study shows that the southern residents lose 5.5 hours of foraging time each day due to noise and disturbance from commercial vessels and whale-watching boats specifically. It doesn’t matter how many salmon are in the sea if the orcas can’t hear to find them. Even as the whales are dying in front of us, the number of whale-watching boats continues to grow. In the peak season of May through October, dozens of boats follow them all day, every day, throughout the Salish Sea. The boats and the recreational boats they attract form a floating corral which the whales cannot evade, escape or hide from. Except for distance guidelines, the whale-watching industry is unregulated. Anyone who has a commercial license to carry passengers can become a whale-watch operator. There is no limit to the number of boats, the number of trips per day, the length of time they can be with the whales, or the areas where they are allowed to operate. It is a free-for-all on both sides of the border, and the orcas are paying the price. How many boats were on scene when J35 was giving birth? How did their presence influence her calf’s ability to survive? There is a role for sustainable boat-based whale-watching. It must be sustainable for the whales, first. The best available science shows that to recover the orcas, we must both increase the amount of salmon and decrease the amount of noise. Increasing salmon by 15 percent and decreasing noise by 50 percent will achieve NOAA’s recovery goal of 2.3 percent population growth per year. Turning down the volume in the Salish Sea is the most effective thing we can do to recover these whales in the short term. 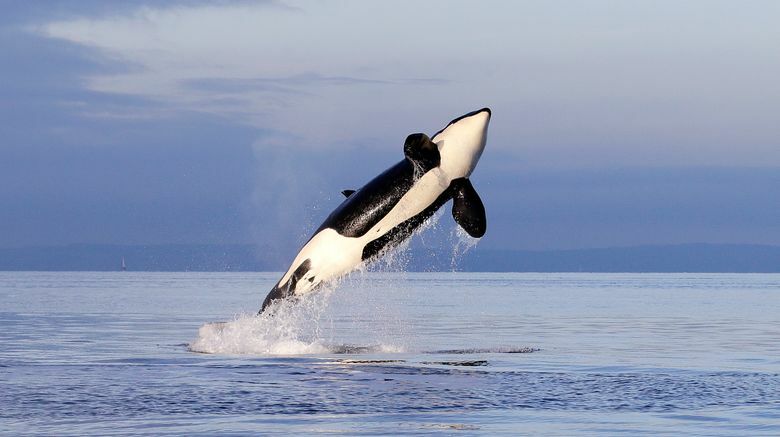 Twice before, Washington state has acted to protect orcas. In 1976, the state sued NOAA Fisheries to stop Sea World from capturing these same pods. In 2002, we worked together to rescue a stranded orca, A73 (Springer), and return her to her pod on the north side of Vancouver Island. Gov. Jay Inslee’s task force is a critical step in the right direction — perhaps our last and best chance to save these pods. Will we do enough, fast enough, to make a difference for J35 and her kin? I hope so. Two weeks ago I was at Lime Kiln Point State Park when we heard that J pod was heading our way. People lined the cliffs and crowded the rocky shore. We could see the whales on the horizon. First their blows, then their dorsal fins came into view. It was like waiting for Christmas. As the whales approached, we could hear them breathe. Phwoosh! The sound of their exhalations carried across Haro Strait. Some people clapped, and some people cried. The sea glowed orange, reflecting a fiery sky. “How lucky are we!,” a man said to his kids. The whales continued north, their blows backlit in the setting sun. Three huge whale-watching boats stayed with them even as they disappeared into the dark. Donna Sandstrom is director of The Whale Trail, a nonprofit organization headquartered in Seattle, and a member of Gov. Jay Inslee's task force on southern resident killer whales.